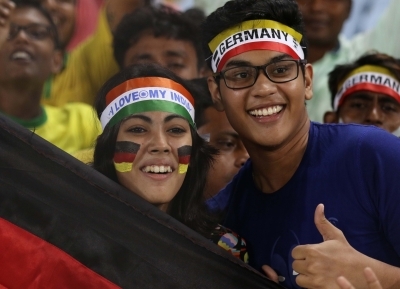 Kolkata, Oct 22 (IANS) As if the Kolkata football fanatics were not enough, four Brazilian fans, including one die-hard Club Atletico Paranaense supporter, thronged the Vivekananda Yuba Bharati Krirangan for the Brazil-Germany big-ticket FIFA Under-17 World Cup quarter-final here on Sunday. “I am here to support my team. I have come all the way from Brazil and I feel we will win 8-0 tonight. This will be perfect revenge for the 1-7 loss in the World Cup three years back,” Luis Lopez said before entering the stadium. Adding more colour were members from the German Consulate General who were also seen donning the hallowed white jersey with black stripes and holding aloft the country’s flag on their way to the stadium. All roads led to the colossal venue on this weekend holiday. A sea of yellow, the Brazilian colour, was seen outside the revamped ampitheatre, set to house a capacity 66,000 spectators. It seemed as if the city has come up with a big “yes” to Brazil prodigy Paulinho’s pre-match assertion that the team was feeling at home and expected the crowd would egg them on. Germany coach Christian Wueck had earlier said they are not flustered by the feeling of an ‘away’ team and would rather enjoy the hostility. The football-crazy city has traditionally supported the Samba boys before splitting loyalties with the advent of a certain Diego Maradona who helped Brazil’s arch-rivals Argentina lift the World Cup for the second time. 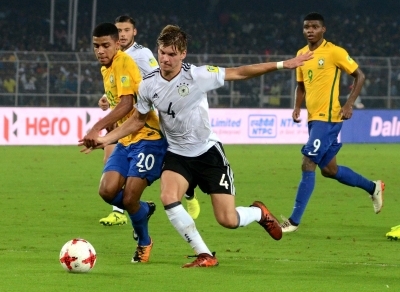 Demand for tickets has been sky-high since the three-time U-17 World Cup winners were drawn to play Germany here after getting past Honduras 3-0 in the pre-quarters. 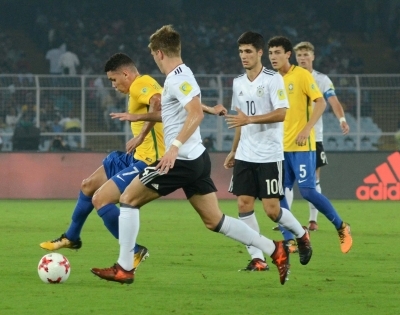 Less than an hour before kick-off, with the stands slowly filling up, a huge roar greeted the Brazilian youngsters as they ran onto the greens and soon after started juggling.